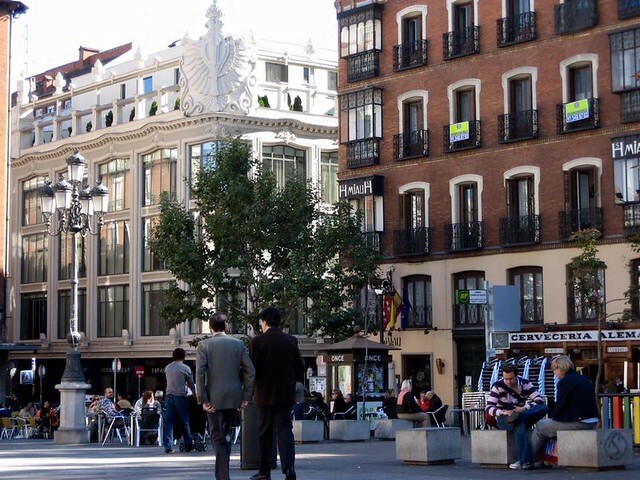 What to see in Madrid in two days? 48h hours in Madrid are not sufficient to give justice to the incredible art scene, food offering and enviable architecture of the Spanish capital. In this article, I share my favourite itinerary. Today I am buzzing. I have had a busy week filled with chores and deadlines, but tomorrow I am treating myself to something I have been looking forward to for a few months now: a week-end away in beautiful Madrid with a friend! I have visited Madrid many times and while I can’t say I know the city like a local, I go there with that peculiar state of mind typical of the returning tourist: a desire to revisit some old favourite spots and the itch to discover some new corners. This is the itinerary I recommend to make the most of 2 days in Madrid and details on how I organised my three days in the area. Have breakfast and then top up your sugary need in the Chocolateria San Gines, the place to be for Churros and chocolate. Then, make your way to one of Madrid’s museums. Barajas airport is far but well connected to the city and I will catch the metro to get to the city centre and to Plaza Santa Ana, where my hotel is located. It’s a wonderful square, overlooked by the Teatro Espanol and by the statues of two important Spanish personalities: play writer Pedro Calderón de la Barca (1600 – 1681) and Federico García Lorca (1898 – 1936), poet and dramatist, killed by the Nationalists during the Spanish Civil War. Here we are probably going to check out some shops and then take a stroll and a bite in either Mercado San Miguel (wonderful) or in the ‘caves‘ under the square. I have always thought of the cellars in this part of town as a bit of a tourist trap, but I recently heard they serve the best mushrooms in the world. I am not a mushroom lover, but if something is considered ‘best in the world’, can you really not give it a shot? There are many reasons why I chose Madrid for this week end away and one of them is the fact that Madrid has an Hammam or an Arab bath house. The tradition of bath houses in Spain dates back to Moorish times and you find beautifully elaborated bath houses especially in Andalucia (Sevilla and Cordoba have spectacular ones). I have been to the Arabic baths a few times but always only in Spain so I cannot gauge how authentic the experience is (I suspect, not so much), but one thing I can guarantee: the water, the subdued lights, the vaulted ceilings and the free flowing mint tea make for a wonderfully relaxing experience! I have been to the Arabic baths a few times but always only in Spain so I cannot gauge how authentic the experience is (I suspect, not so much), but one thing I can guarantee: the water, the subdued lights, the vaulted ceilings and the free flowing mint tea make for a wonderfully relaxing experience! Hopefully equally relaxed and energized by the power of water, heat and massages, we will take a stroll towards the royal palace and then head towards the temple of Debod, nearby. This is an attraction I have only recently heard about and I am excited to see: it’s an Egyptian temple dating back to the II century b.C and that made its way to Spain in 1960. I have always wanted to go to Egypt, so while I work on a budget to do that, I am hoping to take a glance of the temple in the Madrilean sunset. This is an attraction I have only recently heard about and I am excited to see: it’s an Egyptian temple dating back to the II century b.C and that made its way to Spain in 1960. I have always wanted to go to Egypt, so while I work on a budget to do that, I am hoping to take a glance of the temple in the Madrilean sunset. Near that, I hear there is a teleferico (cable car) that brings you to a belvedere terrace from which you get a bird-eye view over Madrid. I read there is a terrace and a cafe so I count on a short stop there before an evening of tapas in nearby Malasagna. We are probably going to start the day with breakfast in San Gines, the cafe famous for hot chocolate and churros and then we are going to head to the train station for a day trip to Toledo! Just abut an hour by train from Madrid, Toledo is said to be one of the medieval jewels of Spain. It’s a UNESCO heritage site famous for its architecture and museum and I have never been. I am told it is reasonably small so I didn’t make a detailed itinerary for it, but I do hope to see the Alcazar, the cathedral, and the town famous Monastery. Just abut an hour by train from Madrid, Toledo is said to be one of the medieval jewels of Spain. It’s a UNESCO heritage site famous for its architecture and museum and I have never been. I am told it is reasonably small so I didn’t make a detailed itinerary for it, but I do hope to see the Alcazar, the cathedral, and the town famous Monastery. Dinner is going to be back in Madrid: a friend recommended a place called Bar Tomate in Chamberi and it sounds like a good address (I’ll try and report back!). After that, I believe we will make the most of the terrace of our own hotel, which is described by my guidebook as ‘painfully hipster’ – I guess for my one week end away without the kids, going there is a must. I am told that Spaniards have adopted the tradition of Sunday brunch and I am more than happy to jump on that bandwagon and join them! Allegedly, the best brunch in town is in Mur Cafe, near Plaza de Espana and I am also very tempted by Cafe de Oriente, that seems to promise cozy ambiance and traditional fare. Ready for the day, our next stop is going to be the Thyssen Bornemitza museum. Madrid has many incredible museums and galleries, but the Thyssen is the one I tend to always go back to: a beautiful location and building, it has a stunning permanent collection and always interesting temporary exhibition. I have been about five times and never got disappointed, so I believe a stop is almost compulsory. After this, we’ll stretch to the Retiro, Madrid’s beautiful urban park and will then slowly make our way back to the centre of town. Shops are closed on Sunday, I believe, in all neighborhood but the centre, so I imagine our girlie week end will finish with a good browse for colorful Spanish fashion in the area around Puerta del Sol, before heading back to the airport. I hope you enjoyed this itinerary to see Madrid in 2 days Safe travels!